It’s amazing how good something as simple as roasted cauliflower can taste after you’ve been relegated to ordering takeout or eating a can of chickpeas and calling it dinner a few nights in a row. You see, last weekend, I bit off a big kitchen project. I’m not talking about a fun kitchen project; there were no homemade ravioli, certainly no baked goods, rather hours upon hours of scrubbing, sanding, taping, painting, and, naturally, a few bouts of insanity. When I finally got things (mostly) back together, I couldn’t bear the thought of making anything that might splatter my newly grease-free, freshly painted walls, so I took it easy on myself and made the restaurant and culinary magazine vegetarian darling du jour: cauliflower steaks. 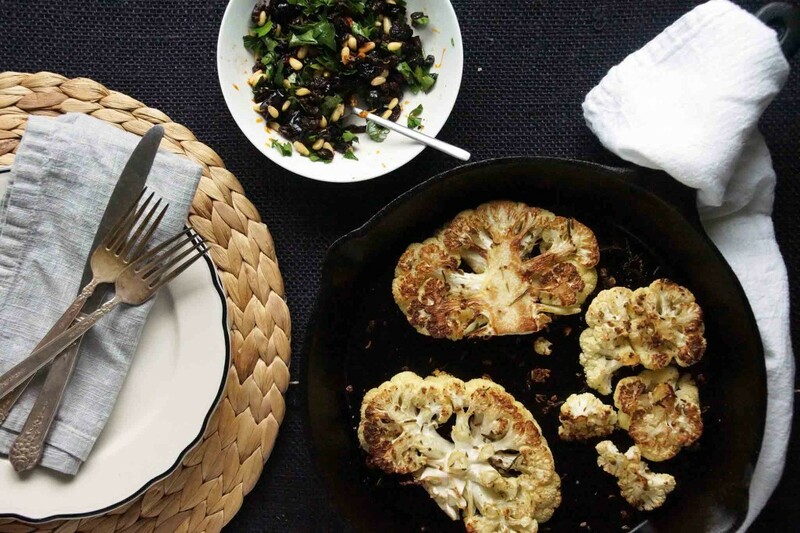 Now I love roasted cauliflower, but it can be hard to make it feel like an entrée. Cutting it in thick slabs and treating it as if it’s a big, meaty steak remedies that. We’ll start by making a rub using rosemary, fennel, and coriander. 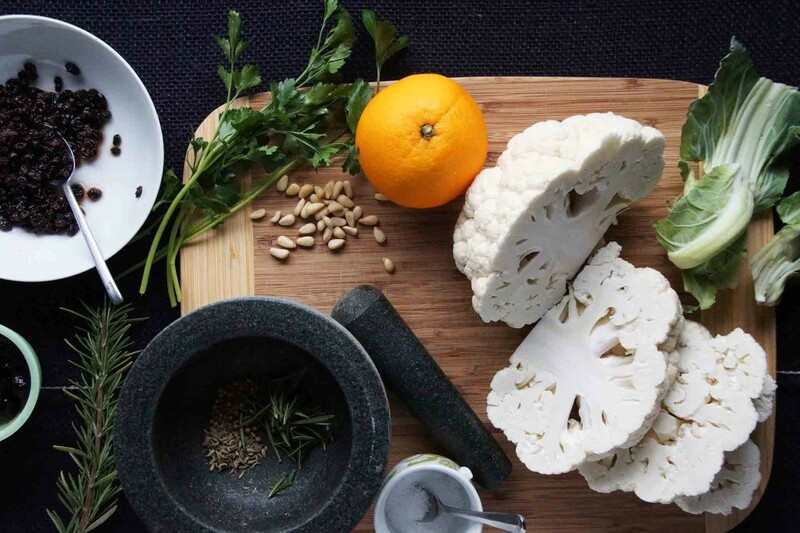 Brush the cauliflower with a little olive oil, then rub the herbs into the “steaks”. Sear those babies in a pan and finish in the oven, just like you would any steak that previously had legs. 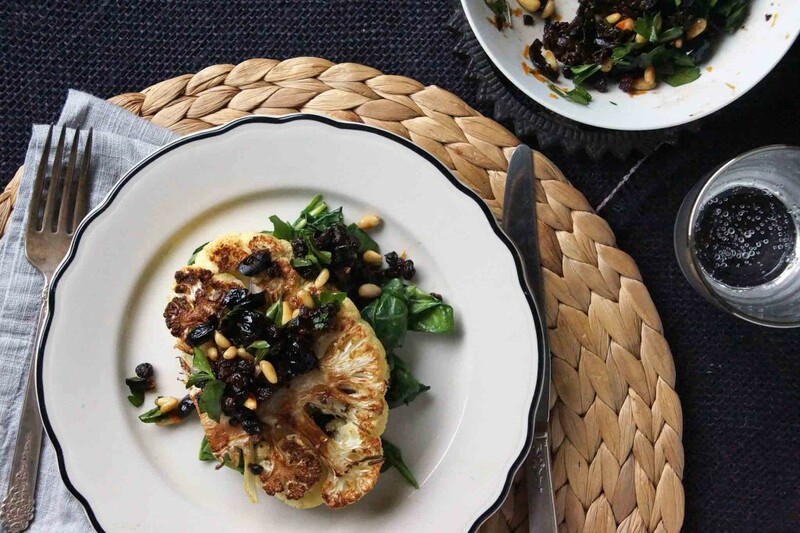 While the cauliflower “steaks” roast, mix up a citrusy olive and currant gremolata to spoon over the finished steaks. 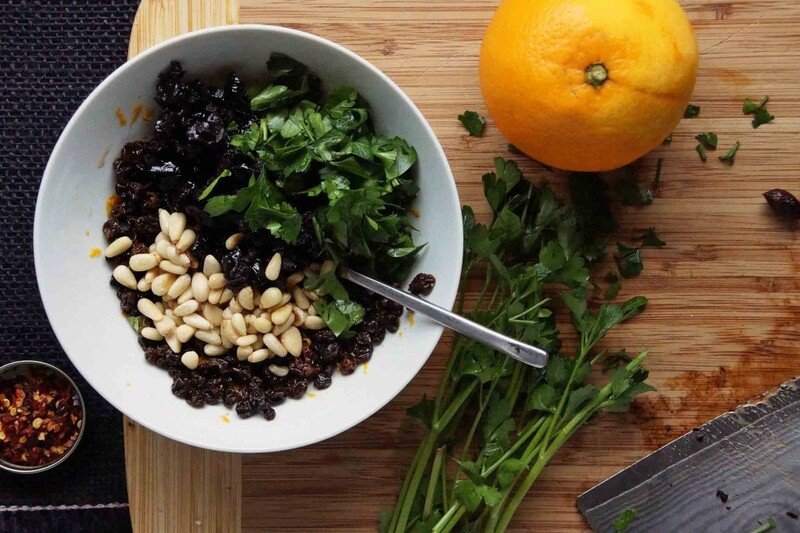 We’ll use one of my favorite tricks and plump dried currants in vinegar, then add chopped oil-cured black olives, orange zest, a handful of toasted pine nuts, a pinch of red pepper flakes, and plenty of fresh parsley. Pull the cauliflower out of the oven when they are nice and golden on the outside, tender on the inside. This is the 1 kind of steak I prefer well-done over rare. Plate ’em up and dinner is ready. It’s good to be back at the edible kitchen projects. I managed to get 4 steaks out of a head of cauliflower though 1 fell apart in the pan. If you want more than 2 really beautiful steaks, I'd use the 2 inner most slices from separate heads and reserve the rest for another use. Serve over sautéed spinach with a side of quinoa or couscous for a full meal. Place the currants and vinegar in a small bowl and allow to plump while you prepare the cauliflower. Remove the outer leaves from the cauliflower and trim the base. Cut in 4¾-1 in. thick slices. Combine the coriander, fennel, and rosemary needles and lightly crush, using mortar and pestle, then stir in the salt. 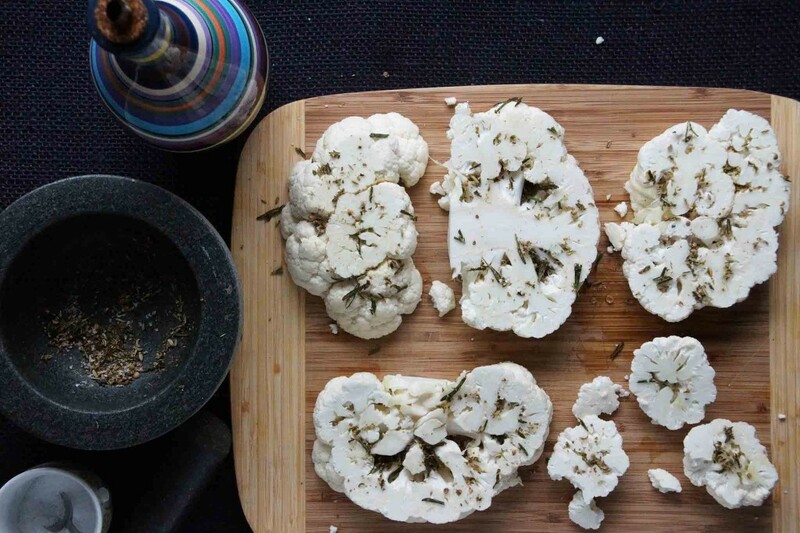 Brush the cauliflower slices with a little oil then rub with the herb mixture. Generously coat 2 oven-proof skillets with olive oil and heat over medium-high. 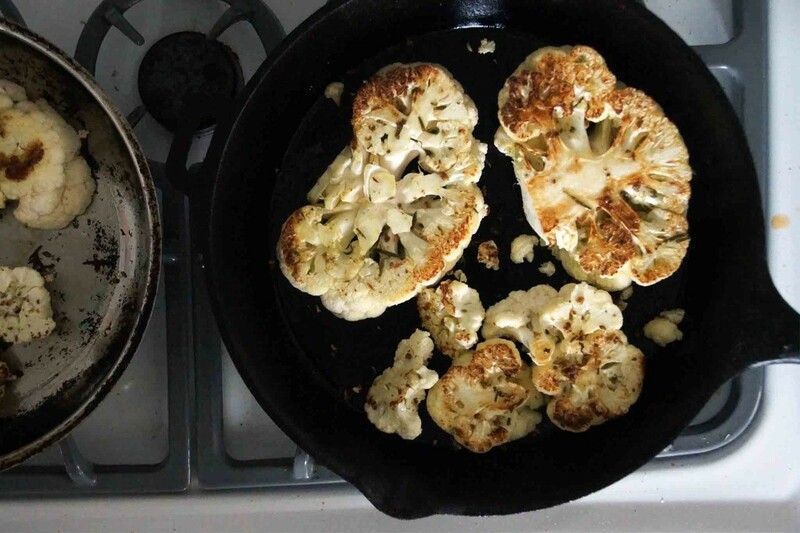 Gently place the cauliflower steaks in the pans. Sear until a golden crust forms, about 5 minutes, then carefully flip and transfer the pans to the oven. Roast until the cauliflower is very tender when pricked with the tip of a knife, about 25 minutes. Meanwhile, make the gremolata. Add the chopped olives, pine nuts, orange zest, parsley, and a pinch or 2 of red pepper flakes to the currants and vinegar. Toss and taste. I doubt you'll need salt as the saltiness of the olives will likely be enough, but adjust the acidity with additional vinegar and the heat with additional red pepper, as necessary. 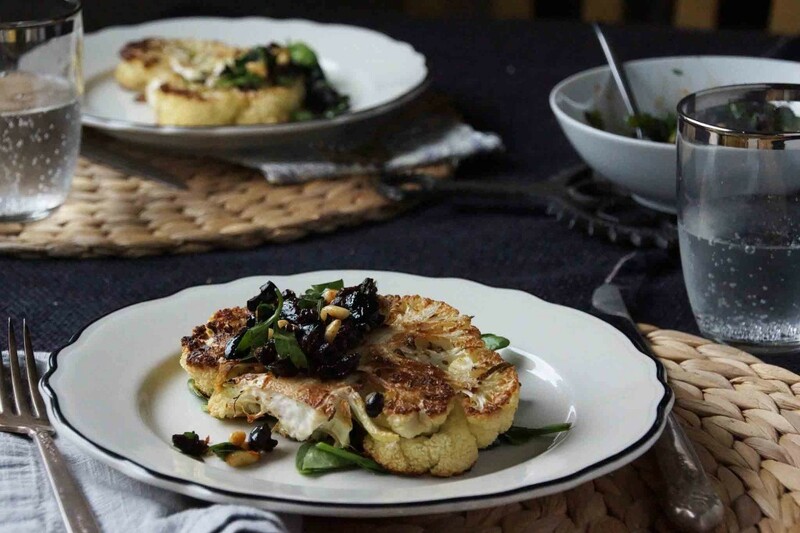 Serve the cauliflower steaks hot with the currant and olive gremolata spooned over the top. How do you come up with these creations?? Now I want to see your kitchen! Feel free to come see it AND help me finish it…I still don’t have my cupboard doors back up! 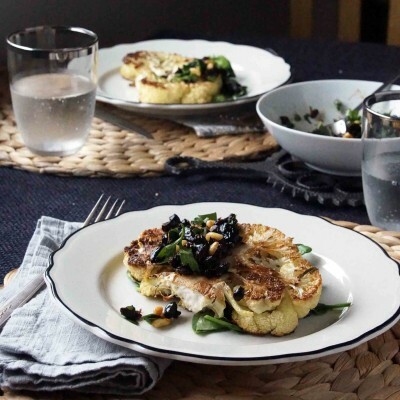 These pictures are beautiful and I love cauliflower steak – love the additional of the black olive gremolata. Yum!